Home / Opinion / Trending / Niño Muhlach feels sorry for portraying Paco Larrañaga : "SORRY PACO. We all know the truth by now!" 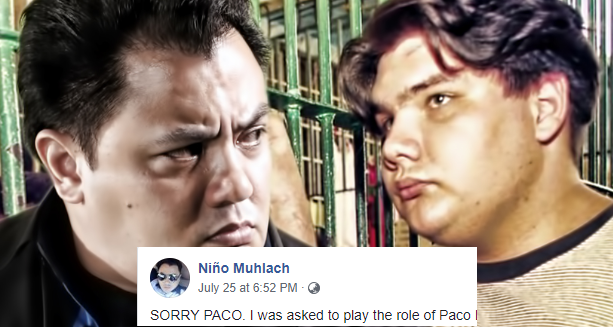 Niño Muhlach feels sorry for portraying Paco Larrañaga : "SORRY PACO. We all know the truth by now!" These past couple of weeks, the controversial case of the Chiong sisters and the allegedly mastermind of the crime, Paco Larrañaga, made a buzz on social media after a documentary titled "Give Up Tomorrow" produced in 2011, demonstrated Larrañaga's side of the story were reemerged by netizens. The case become overly dubious after Viva released its most recent film "Jacqueline Comes Home", a film based in the true-to-life tragic story of the Chiong sisters, Marijoy and Jacqueline, who were allegedly seized, assaulted and for Marijoy's case, murdered in Cebu City. Netizens, family and friends of both sides then bombarded social media with their opinions and supports. Some say that there was a mistrial and unfair conviction of the suspects since allegedly, one or both sisters are still alive. Several netizens called to revisit the case and some even propelled a social media page, calling to free Larrañaga, whom they assert as "innocent." Correspondingly, others are saying that there has been an obstruction of justice because of the way that witnesses and evidences weren't acknowledged amid the preliminary. 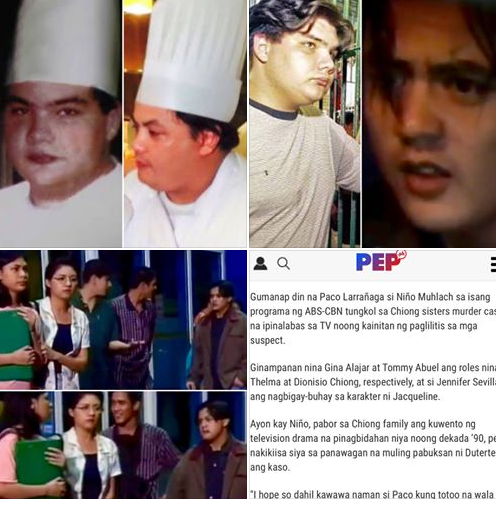 One celebrity who showed support to Paco Larrañaga is actor Niño Muhlach, who had played the role of Paco in an episode of ABS-CBN’s now-defunct crime show “Calvento Files”. The episode was aired during the height of the controversial case. In his Facebook account, the former child wonder of the Philippine cinema wrote his apology and shared stitched photos of Larrañaga and himself while he portrayed Larrañaga. "Sorry Paco." the actor first wrote on his apology. He then explained that he was just asked to play the role of Paco Larranaga for Calvento Files at the time the case was being heard on National television. And as an actor, he was asked to depict Paco as a medication crazy person. "I was asked to play the role of Paco Larranaga for CALVENTO FILES that was aired on ABS CBN at the time the case of the chiong sisters was being heard on National tv. As an actor, i was asked to to portray Paco as a drug crazed maniac. ", Muhlach wrote. However, Niño said he felt regretful for doing the part after watching the documentary that aims to explain the case in-depth. "But after watching GIVE UP TOMORROW it made me feel guilty for putting him in a bad light. ", he added. Likewise, Muhlach wrote that everybody knows the truth by now and asked everyone one to stand up and battle for Paco and whatever is left of the Chiong 7 needed to endure. "We all know the truth by now! Lets stand up & fight for the injustice that Paco & the rest of the chiong 7 had to suffer! ", Muhlach exclaimed. "SORRY PACO. I was asked to play the role of Paco Larranaga for CALVENTO FILES that was aired on ABS CBN at the time the case of the chiong sisters was being heard on National tv. As an actor, i was asked to to portray Paco as a drug crazed maniac. But after watching GIVE UP TOMORROW it made me feel guilty for putting him in a bad light. But as an actor i had to follow what the script required from me. We all know the truth by now! Lets stand up & fight for the injustice that Paco & the rest of the chiong 7 had to suffer! #freePacoNow"